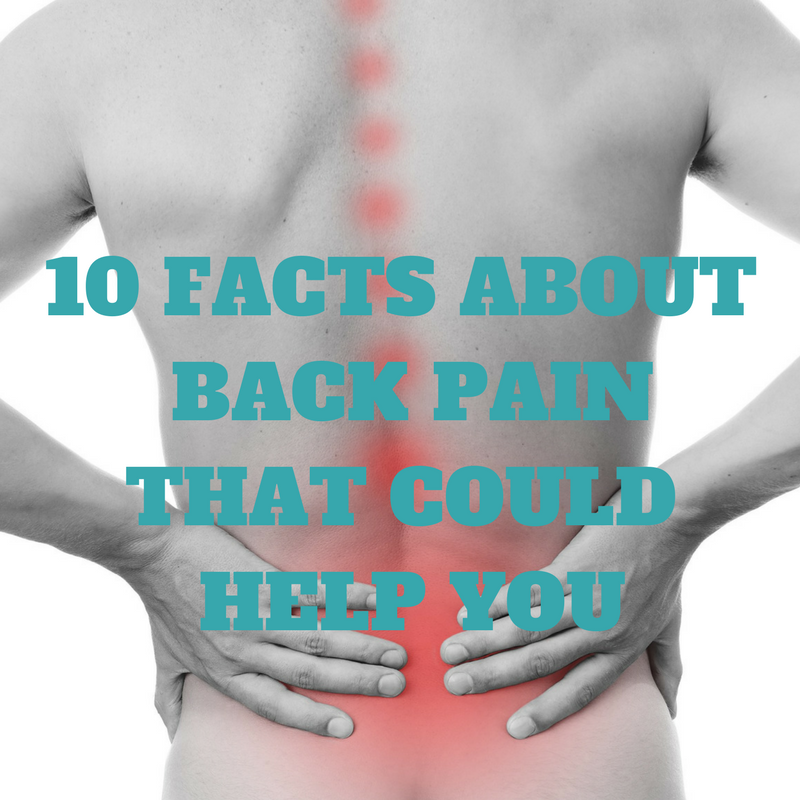 10 Top facts about back pain that could help YOU! Even in today’s modern well researched healthcare era, there are still some common misunderstandings regarding back pain. Here are some myths and tips that could help you! 1. Back pain is rarely the result of serious injury or illness. Back pain is common! And most of the time not serious. If you are still worried any healthcare practitioner worth their salt will be able to identify whether it is and re-assure you! 2. Exercise and being generally active will usually help back pain. Most people that I see in clinic often comment on how their back is worse first thing in the morning or after sitting/being static for long periods and then better once they get up and moving. Get up and move! 3. Rest in almost all cases is not helpful. Moving is good for your health. Fear avoiding activity and movement will often lead to more pain and discomfort and will make it last longer. 4. Your back is not weak! Many time I hear clients say “my back’s weak” or “I have a weakness in my back”. Utter codswallop. Your back is incredibly robust. The perception of weakness is caused by the experience of pain, and (I hate to say it) from poor language used by healthcare practitioners such as: you need to “strengthen your back, or your back or core is weak”. If you don’t believe me (and aren’t squeamish) take look at dissection videos on youtube. All you have to do is watch them to realise your back is pretty phenomenal really. 5. Exercise and movement of your back keeps it healthy. Often I find people are afraid to bend or twist their backs in certain ways. To be fair in the context of very heavy gym lifting, I can see the merit of using good and proper form, but day to day you should not fear to bend or twist your back. Your back maintains its health from movement. To not move would be to negatively impact its health. 6. Pain does not equal damage. Sometimes pain is a great witness. For example, tear and hamstring while sprinting and that is a useful response to prevent further damage. Back pain is much more complex. Often back will start without trauma or specific onset and given the robustness of your back it is unlikely that any significant damage would be sustained. Take this for example: it is estimated that if you scanned everyone in the population – as much as 50% of people would have a disc bulge or injury of some description. But only 1% of those 50% would have any pain or symptoms. 7. Soreness after exercise is normal. It is important to recognise that you may be sore after exercise and that this is normal. If you don’t it will tend to lead to avoidance of exercise or activity and as we already mentioned that is most definitely NOT good for your back. 8. Your spine is not out of alignment! AND practitioners CANNOT realign your spines. This is a common misunderstanding, and I can see why it happens. Often people will walk into the clinic with an ‘antalgic posture’. This is a fancy pants way of saying standing crooked due to pain. Often after one session your pain will decrease, so by the end of 30-60 mins you will often have less pain and stand more normally. But we do not realign your spines because it was never out of alignment in the first place! 9. Surgery is not a cure-all! To be fair this is less common, but people do sometimes say “I think I might need surgery” or “I’m gonna have to have surgery I’ve tried everything”. I have it on good authority from a top spinal surgeon that surgery has only a 50% chance of improving your symptoms at all. The other 50% get worse or have no change at all, in which case you’ll be left with the scars from an irreversible procedure and no improvement in your back pain. In fact he said he spends more time trying to talk patients out of surgery than he does recommending it. At Back to Health I would say 90% of patients see some improvement in their back pain – which I think you’ll agree are far better odds. 10. Scans for back pain are rarely needed or helpful. Let’s say you’ve got back pain and you’ve had a scan which shows a disc bulge in your spine. That does not prove that that is the source of your pain. It’s just an image, a snapshot of your back that most of the time isn’t helpful. And based on what we have just in point number 6, I would argue it is probably more harmful than good as it could lead to the perception that the back is damaged and weak – which know is definitely not helpful. Of course there are rare occasions where scans may be necessary, but any decent practitioner will be able to decide when this is the case.